For our twelfth installment let's take a look at the most common Unmanned Aerial Vehicle (UAVs) of the war in Afghanistan. These can be anything from surveillance and Reconnaissance UAVs, to UAVs armed with precision-guided munitions. UAVs have played a larger role in the modern conflicts of Afghanistan and Iraq, and the Global War on Terror overall. The General Atomics MQ-9 Reaper is an unmanned aerial vehicle (UAV) capable of remote controlled or autonomous flight operations, developed by General Atomics Aeronautical Systems (GA-ASI) primarily for the United States Air Force. The MQ-9 and other UAVs are referred to as Remotely Piloted Vehicles/Aircraft (RPV/RPA) by the USAF to indicate their human ground controllers. The MQ-9 is the first hunter-killer UAV designed for long-endurance, high-altitude surveillance. In 2006, the then–Chief of Staff of the United States Air Force General T. Michael Moseley said: "We've moved from using UAVs primarily in intelligence, surveillance, and reconnaissance roles before Operation Iraqi Freedom, to a true hunter-killer role with the Reaper." The MQ-9 is a larger, heavier, and more capable aircraft than the earlier General Atomics MQ-1 Predator; it can be controlled by the same ground systems used to control MQ-1s. The Reaper has a 950-shaft-horsepower turboprop engine (compared to the Predator's 115 hp piston engine). The greater power allows the Reaper to carry 15 times more ordnance payload and cruise at about three times the speed of the MQ-1. The aircraft is monitored and controlled by aircrew in the Ground Control Station (GCS), including weapons employment. 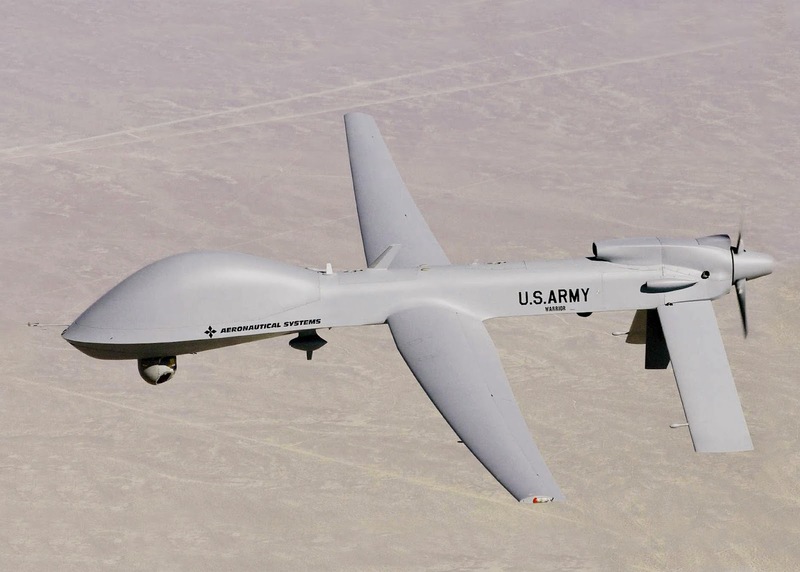 In 2008, the New York Air National Guard 174th Attack Wing began the transition from F-16 piloted fighters to MQ-9 Reapers, becoming the first fighter squadron conversion to an all–unmanned combat aerial vehicle (UCAV) attack squadron. In March 2011, the U.S. Air Force was training more pilots for advanced unmanned aerial vehicles than for any other single weapons system. The Reaper is also used by the United States Navy, the CIA, U.S. Customs and Border Protection, NASA, and the militaries of other countries. The USAF plans to keep the MQ-9 in service into the 2030s. A typical MQ-9 system consists of multiple aircraft, ground control station, communications equipment, maintenance spares, and personnel. A military crew comprises a pilot, sensor operator, and Mission Intelligence Coordinator. The aircraft is powered by a 950 horsepower turboprop, with a maximum speed of about 260 knots (300 mph) and a cruising speed of 150–170 knots (170–200 mph). With a 66 ft wingspan, and a maximum payload of 3,800 lb, the MQ-9 can be armed with a variety of weaponry, including Hellfire missiles and 500-lb laser-guided bomb units. Endurance is 30 hours when conducting ISR missions, which decreases to 23 hours if it is carrying a full weapon load. The Reaper has a range of 1,000 nmi (1,150 mi) and an operational altitude of 50,000 ft, which makes it especially useful for long-term loitering operations, both for surveillance and support of ground troops. An MQ-9 can adopt various mission kits and combinations of weapons and sensors payloads to meet combat requirements. Its Raytheon AN/AAS-52 multi-spectral targeting sensor suite includes a color/monochrome daylight TV, infrared, and image-intensified TV with laser rangefinder/laser designator to designate targets for laser guided munitions. The aircraft is also equipped with the Lynx Multi-mode Radar that contains synthetic aperture radar (SAR) that can operate in both spotlight and strip modes, and ground moving target indication (GMTI) with Dismount Moving Target Indicator (DMTI) and Maritime Wide-Area Search (MWAS) capabilities. The Reaper was used as a testbed for Gorgon Stare, a wide-area surveillance sensor system. Increment 1 of the system was first fielded in March 2011 on the Reaper and could cover an area of 6.2 sq mi; increment 2, incorporating ARGUS-IS and expanding the coverage area to 39 sq mi, achieved initial operating capability in early 2014. The system has 368 cameras capable of capturing 5 million pixels each to create an image of about 1.8 billion pixels; video is collected at 12 frames per second, producing several terabytes of data per minute. On 1 May 2007, the USAF's 432d Wing was activated to operate MQ-9 Reaper as well as MQ-1 Predator UAVs at Creech Air Force Base, Nevada. The pilots first conducted combat missions in Iraq and Afghanistan in the summer of 2007. On 28 October 2007, the Air Force Times reported an MQ-9 had achieved its first "kill", successfully firing a Hellfire missile against Afghanistan insurgents in the Deh Rawood region of the mountainous Oruzgan province. By 6 March 2008, according to USAF Lieutenant General Gary North, the Reaper had attacked 16 targets in Afghanistan using 500 lbs bombs and Hellfire missiles. On 13 September 2009, positive control of an MQ-9 was lost during a combat mission over Afghanistan, after which the control-less drone started flying towards the Afghan border with Tajikistan. An F-15E Strike Eagle disabled the Reaper's engine with an AIM-9 missile. The satellite link with the vehicle was restored and the operator steered it into a mountainside. It was the first US drone to be destroyed intentionally by allied forces. The Northrop Grumman RQ-4 Global Hawk is an unmanned (UAV) surveillance aircraft. It was initially designed by Ryan Aeronautical (now part of Northrop Grumman), and known as Tier II+ during development. The Global Hawk performs a similar role as the Lockheed U-2. The RQ-4 provides a broad overview and systematic surveillance using high-resolution synthetic aperture radar (SAR) and long-range electro-optical/infrared (EO/IR) sensors with long loiter times over target areas. It can survey as much as 40,000 square miles of terrain a day. The Global Hawk UAV system comprises the RQ-4 air vehicle, which is outfitted with various equipment such as sensor packages and communication systems; and a ground element consisting of a Launch and Recovery Element (LRE), and a Mission Control Element (MCE) with ground communications equipment. Each RQ-4 air vehicle is powered by an Allison Rolls-Royce AE3007H turbofan engine with 7,050 lbf (31.4 kN) thrust, and carries a payload of 2,000 pounds. The fuselage comprises an aluminum, semi-monocoque construction with V-tail; the wings are made of composite materials. There have been several iterations of the Global Hawk with different features and capabilities. The first version to be used operationally was the RQ-4A Block 10, which performed imagery intelligence (IMINT) with a 2,000 lbs payload of a synthetic aperture radar (SAR) with electro-optical (EO) and infrared (IR) sensors; seven A-model Block 10s were delivered and all were retired by 2011. The RQ-4B Block 20 was the first of the B-model Global Hawks, which has a greater 3,000 lbs payload and employs upgraded SAR and EO/IR sensors; four Block 20s were converted into communications relays with the Battlefield Airborne Communications Node (BACN) payload. The RQ-4B Block 30 is capable of multi-intelligence (multi-INT) collecting with SAR and EO/IR sensors along with the Airborne Signals Intelligence Payload (ASIP), a wide-spectrum signals intelligence (SIGINT) sensor. The RQ-4B Block 40 is equipped with the multi-platform radar technology insertion program (MP-RTIP) active electronically scanned array (AESA) radar, which provides SAR and moving target indication (MTI) data for wide-area surveillance of stationary and moving targets. Since the RQ-4 is capable of conducting sorties lasting up to 30 hours long, scheduled maintenance has to be performed sooner than on other aircraft with less endurance. However, since it flies at higher altitudes than normal aircraft, it experiences less wear during flight. Following the September 11th attacks, the normal acquisition process was ditched almost immediately and early developmental Global Hawk models were employed in overseas contingency operations beginning in November 2001. Global Hawk ATCD prototypes were used in the War in Afghanistan and in the Iraq War. On 11 February 2010, the Global Hawks deployed in the Central Command AOR accrued 30,000 combat hours and 1,500 plus sorties. Initial operational capability was declared for the RQ-4 Block 30 in August 2011. The USAF did not plan to keep the RQ-4B Block 30 in service past 2014 due to the U-2 and other platforms being less expensive in the role; but Congress sought to keep it in service until December 2016. The USAF had 18 RQ-4 Block 30s by the time of the passage of the National Defense Authorization Act for Fiscal Year 2013, which directed a further three RQ-4s to be procured as part of Lot 11; The USAF felt that additional aircraft were "excess to need" and likely become backup or attrition reserve models. Despite the potential retirement of the Block 30 fleet due to low reliability, low mission readiness, and high costs, the USAF released a pre-solicitation notice on 12 September 2013 for Lot 12 aircraft. In planning the USAF's FY 2015 budget, the Pentagon reversed its previous decision, shifting $3 billion from the U-2 to the RQ-4 Block 30, which had become more competitive with the U-2 due to increased flying hours. Factors such as cost per flight hour (CPFH), information gathering rates, mission readiness, adverse weather operational capability, distance to targets, and onboard power still favored the U-2. Previously selected for the United States Special Operations Command in 2008, in March 2012 the United States Army ordered the Puma All Environment (AE) and designated it the RQ-20A. In April, the United States Marine Corps and United States Air Force placed a similar order for the RQ-20A. Each military RQ-20A system has three air vehicles and two ground stations. The Puma AE can operate under extreme weather conditions including temperatures ranging from −20 to 120 °F, wind speeds up to 25 kn (29 mph), and an inch of rain per hour. On 26 July 2013, the Puma became one of the first unmanned aerial vehicles to be granted certification by the Federal Aviation Administration to fly in U.S. airspace for commercial purposes. AeroVironment expects one to be deployed to Alaska to support oil spill response crews and count wildlife. The Puma can safely accomplish observation missions in hazardous Arctic locations, which is safer, cheaper, and more environmentally friendly than using manned aircraft. Commercial certification was the result of previous military certification and the Congressionally-mandated opening of airspace over much of Alaska to small UAVs. The FAA also certified the Boeing Insitu ScanEagle, also planned to be deployed to Alaska. Only three individual Pumas were certified with strict requirements: only one aircraft of the type is allowed airborne at any one time, they cannot fly through clouds or icing conditions, and they cannot take off or land during certain gust and wind conditions. The certifications did not mention line-of-sight control. In August 2016, AeroVironment announced the U.S. Navy had tested and deployed the RQ-20B Puma aboard a Flight I Guided Missile Destroyer, which included the company's Precision Recovery System to autonomously recover the aircraft aboard a ship. The Puma is also being utilized on Navy patrol craft in the Persian Gulf. The General Atomics MQ-1C Gray Eagle (previously the Warrior; also called Sky Warrior and ERMP or Extended-Range Multi-Purpose) is a medium-altitude, long-endurance (MALE) unmanned aircraft system (UAS). It was developed by General Atomics Aeronautical Systems (GA-ASI) for the United States Army as an upgrade of the General Atomics MQ-1 Predator. A Medium-Altitude Long-Endurance (MALE) UAV, the Gray Eagle has an increased wingspan and is powered by a Thielert Centurion 1.7 Heavy Fuel Engine (HFE). This is a Diesel piston engine that burns jet fuel, giving the aircraft better performance at high altitudes. It can operate for 36 hours at altitudes up to 25,000 feet, with an operating range of 200 nautical miles. The aircraft's nose fairing was enlarged to house a synthetic aperture radar/ground moving target indicator (SAR/GMTI) system, and targeting is also provided with an AN/AAS-52 Multi-spectral Targeting System (MTS) under the nose. The aircraft can carry a payload of 800 pounds and may be armed with weapons such as AGM-114 Hellfire missiles and GBU-44/B Viper Strike guided bombs. Its sensors can fuse infrared imagery and use the SAR to scan and detect changes in terrain like tire tracks, footprints, and buried improvised explosive devices when performing a second scan. In May 2013, Raytheon delivered two electronic attack payloads as part of the Army's Networked Electronic Warfare, Remotely Operated (NERO) system, for jamming enemy communications on behalf of the Joint Improvised Explosive Device Defeat Organization (JIEDDO). Derived from the Communications Electronic Attack Surveillance and Reconnaissance (CEASAR) system on the C-12 Huron, mounting NERO on the unmanned Gray Eagle gives reduced risk, reduced operating costs, and two to three times the endurance of electronic attack missions. Test flights showed that the Gray Eagle could operate with the jammer payload without being subject to adverse effects. The Improved Gray Eagle has a maximum gross takeoff weight 4,200 lbs with its 205 hp engine, compared to the Gray Eagle's 3,600 lbs MGTOW and 160 hp engine. The Gray Eagle can carry 575 lbs of fuel, while the IGE can carry 850 lbs of fuel internally with its deep belly design and 500 lbs centerline hardpoint. External fuel tanks can add 450 lbs of extra fuel, allowing for a 50-hour endurance. The IGE also increases internal payload capacity from 400 lbs to 540 lbs. Empty weight is 2,906 lbs, endurance without the external tank is 45 hours, and engine can sustain an output of 180 hp continuously. General Atomics has added new winglets that can increase endurance a further one percent and allow the addition of a new vertical antennae. A special operations configuration can carry two Hellfire missiles and a SIGINT payload for 35 hours, as opposed to 14–15 hours for the Block 1 Grey Eagle. On 23 February 2009, Task Force ODIN performed the first MQ-1B Warrior-Alpha combat missile launch. 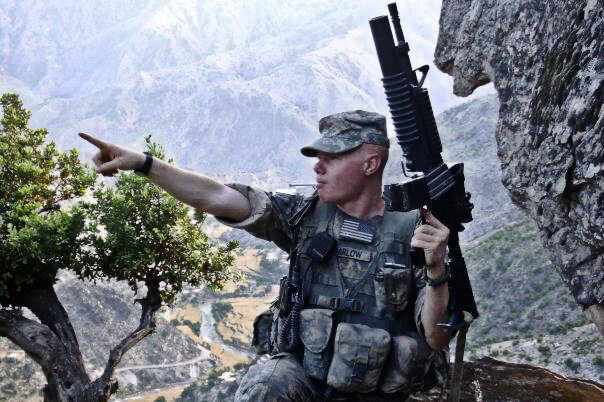 According to General David Petraeus in August 2010, during the previous 90 days in Afghanistan information provided by ODIN had resulted in the killing or capture of 365 militant leaders, detained 1,335 insurgent foot soldiers, and killed another 1,031 Taliban. The IAI RQ-5 Hunter unmanned aerial vehicle (UAV) was originally intended to serve as the United States Army's Short Range UAV system for division and corps commanders. It took off and landed (using arresting gear) on runways. It used a gimbaled EO/IR sensor to relay its video in real time via a second airborne Hunter over a C-band line-of-sight data link. The RQ-5 is based on the Hunter UAV that was developed by Israel Aircraft Industries. In 1995, A Company, 15th Military Intelligence Battalion (Aerial Exploitation) out of Fort Hood, TX was the first Army field unit equipped with the Hunter. A Company conducted multiple successful training rotations to the National Training Center. Then in March 1999, they were deployed to the Republic of Macedonia in support of NATO operations in Kosovo. During the 7 month operation, the Hunter was flown over 4,000 hours. Significant operational success in Kosovo led to resumption of production and technical improvements. Hunter was used in Iraq and other military operations since then. A version armed with the Northrop Grumman GBU-44/B Viper Strike weapon system is known as the MQ-5A/B. As of October 2012, the U.S. Army had 20 MQ-5B Hunters in service. Retirement of the Hunter was expected to be completed in 2013, but Northrop was awarded a support contract for the Hunter in January 2013, extending its missions into 2014. The AAI RQ-7 Shadow is an American unmanned aerial vehicle (UAV) used by the United States Army and Marine Corps for reconnaissance, surveillance, target acquisition and battle damage assessment. Launched from a trailer-mounted pneumatic catapult, it is recovered with the aid of arresting gear similar to jets on an aircraft carrier. Its gimbal-mounted, digitally stabilized, liquid nitrogen-cooled electro-optical/infrared (EO/IR) camera relays video in real time via a C-band line-of-sight data link to the ground control station (GCS). The US Army's 2nd Battalion, 13th Aviation Regiment at Fort Huachuca, Arizona, trains soldiers, marines, and civilians in the operation and maintenance of the Shadow UAV. The RQ-7 Shadow is the result of a continued US Army search for an effective battlefield UAV after the cancellation of the Alliant RQ-6 Outrider aircraft. AAI Corporation followed up their RQ-2 Pioneer with the Shadow 200, a similar, more refined UAV. 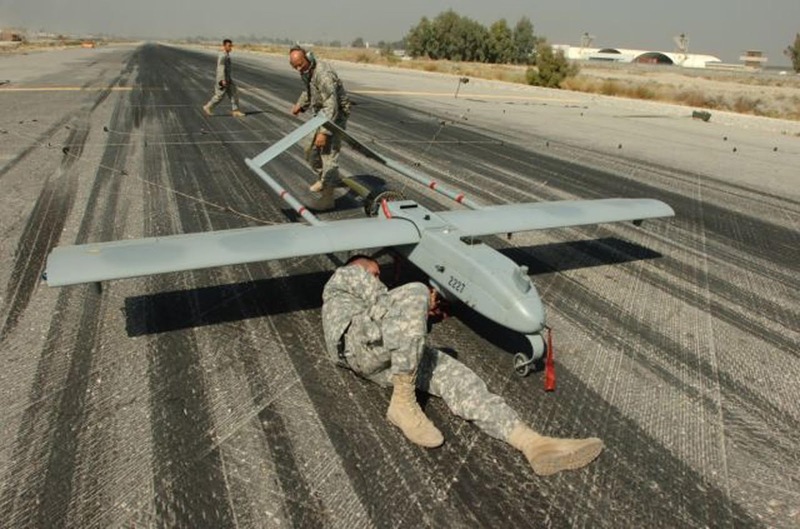 In late 1999, the army selected the Shadow 200 to fill the tactical UAV requirement, redesignating it the RQ-7. Army requirements specified a UAV that used a gasoline engine, could carry an electro-optic/infrared imaging sensor turret, and had a minimum range of 31 miles with four-hour, on-station endurance. The Shadow 200 offered at least twice that range, powered by a 38 hp rotary engine. The specifications also dictated that UAV would be able to land in an athletic field. The U.S. Army is implementing a plan to reform its aerial scout capabilities by scrapping its fleet of OH-58 Kiowa helicopters from 2015–2019 and replacing them with AH-64 Apache attack helicopters teamed with Shadow and MQ-1C Grey Eagle UAVs. Using unmanned assets to scout ahead would put the pilots of manned aircraft out of reach of potential harm. Reformed combat aviation brigades (CAB) would consist of a battalion of 24 Apaches for attack missions and an armed reconnaissance squadron of another 24 Apaches teamed with three Shadow platoons totaling 12 RQ-7s overall; it would also include a Grey Eagle company. The manned-unmanned teaming of Apaches and UAVs can meet 80 percent of aerial scout requirements. On 16 March 2015, the 1st Battalion, 501st Aviation Regiment was reflagged the 3rd Squadron, 6th Cavalry Regiment, making it the first of 10 Apache battalions to be converted to a heavy attack reconnaissance squadron by eliminating the Kiowa scout helicopter and having three RQ-7 Shadow platoons organically assigned; the attack battalions will also be aligned with an MQ-1C Gray Eagle company assigned to each division. Moving Shadows from brigade combat team level to the battalions themselves reduces lines of communication, distance issues, and allows operators and pilots to better train and work together. 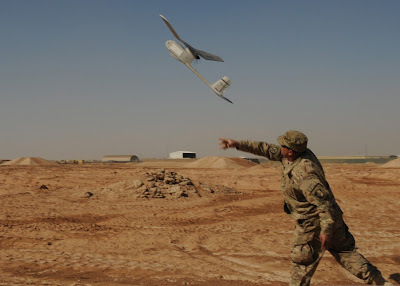 The AeroVironment RQ-11 Raven is a small hand-launched remote-controlled unmanned aerial vehicle developed for the United States military, but now adopted by the military forces of many other countries. The RQ-11 Raven was originally introduced as the FQM-151 in 1999, but in 2002 developed into its current form, resembling an enlarged FAI class F1C free flight model aircraft in general appearance. The craft is launched by hand and powered by a pusher configuration electric motor. The plane can fly up to 6.2 miles at altitudes of appx 500 feet above ground level, and over 15,000 feet above mean sea level, at flying speeds of 28–60 mph. The Raven RQ-11B UAV system is manufactured by AeroVironment. It was the winner of the US Army's SUAV program in 2005, and went into Full-Rate Production in 2006. Shortly afterwards, it was also adopted by the US Marines, and the US Air Force for their ongoing FPASS Program. More than 19,000 Raven airframes have been delivered to customers worldwide to date. A new Digital Data Link-enabled version of Raven now in production for US Forces and allies has improved endurance, among many other improvements. The RQ-11B Raven UAV weighs about 4.2 lb, has a flight endurance of 60–90 minutes and an effective operational radius of approximately 6.2 miles. The RQ-11B Raven UAV is launched by hand, thrown into the air like a free flight model airplane. The Raven lands itself by auto-piloting to a pre-defined landing point and then performing a 45° slope (1 foot down for every 1 foot forward) controlled "Autoland" descent. The UAV can provide day or night aerial intelligence, surveillance, target acquisition, and reconnaissance. In mid-2015, the U.S. Marine Corps tested Harris Corporation's Small Secure Data Link (SSDL), a radio device that fits onto a Raven's nose to provide beyond line-of-sight communications for Marines down to squad level. Acting as communications nodes for ground forces has become an important function for UAVs, but has been restricted to larger platforms like the RQ-4 Global Hawk or RQ-21 Blackjack. Being certified for 'Secret' classification and at just 25 cubic inches (measuring 3 in × 5.3 in × 1.6 in) and weighing 18 oz, the Harris SSDL allows the small Raven UAV to extend communications for troops in the field. 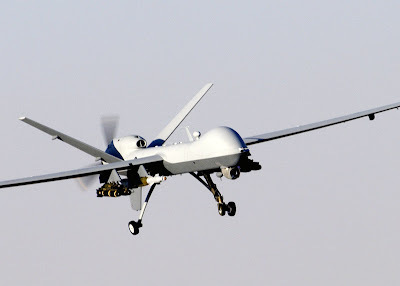 The General Atomics MQ-1 Predator is an American unmanned aerial vehicle (UAV) built by General Atomics and used primarily by the United States Air Force (USAF) and Central Intelligence Agency (CIA). Initially conceived in the early 1990s for aerial reconnaissance and forward observation roles, the Predator carries cameras and other sensors but has been modified and upgraded to carry and fire two AGM-114 Hellfire missiles or other munitions. The aircraft, in use since 1995, has seen combat in war in Afghanistan, Pakistan, the NATO intervention in Bosnia, Serbia, Iraq War, Yemen, Libyan civil war, the intervention in Syria, and Somalia. The USAF describes the Predator as a "Tier II" MALE UAS (medium-altitude, long-endurance unmanned aircraft system). The UAS consists of four aircraft or "air vehicles" with sensors, a ground control station (GCS), and a primary satellite link communication suite. Powered by a Rotax engine and driven by a propeller, the air vehicle can fly up to 400 nmi (460 mi) to a target, loiter overhead for 14 hours, then return to its base. On 16 February 2001 at Nellis Air Force Base, a Predator successfully fired three Hellfire AGM-114C missiles into a target. The newly armed Predators were given the designation of MQ-1A. Following 2001, the RQ-1 Predator became the primary unmanned aircraft used for offensive operations by the USAF and the CIA in Afghanistan and the Pakistani tribal areas; it has also been deployed elsewhere. In 2002, the USAF officially changed the designation to MQ-1 ("M" for multi-role) to reflect its growing use as an armed aircraft. As of March 2009, the U.S. Air Force had 195 MQ-1 Predators in operation. Predators and Reapers fired missiles 244 times in Iraq and Afghanistan in 2007 and 2008. A report in March 2009 indicated that U.S. Air Force had lost 70 Predators in air crashes during its operational history. Fifty-five were lost to equipment failure, operator error, or weather. Four have been shot down in Bosnia, Kosovo, or Iraq. Eleven more were lost to operational accidents on combat missions. In 2012, the Predator, Reaper and Global Hawk were described as "... the most accident-prone aircraft in the Air Force fleet." On 3 March 2011, the U.S. Air Force took delivery of its last MQ-1 Predator in a ceremony at General Atomics' flight operations facility. Since its first flight in July 1994, the MQ-1 series has accumulated over 1,000,000 flight hours and maintained a fleet fully mission capable rate over 90 percent. 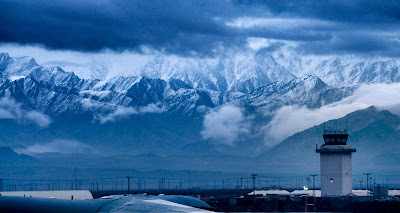 Bagram Airfield, near Kabul, Afghanistan. The C-17 is 174 feet long and has a wingspan of about 170 feet. It can airlift cargo fairly close to a battle area. The size and weight of U.S. mechanized firepower and equipment have grown in recent decades from increased air mobility requirements, particularly for large or heavy non-palletized outsize cargo. The C-17 is powered by four Pratt & Whitney F117-PW-100 turbofan engines, which are based on the commercial Pratt and Whitney PW2040 used on the Boeing 757. Each engine is rated at 40,400 lbf of thrust. The engine's thrust reversers direct engine exhaust air upwards and forward, reducing the chances of foreign object damage by ingestion of runway debris, and providing enough reverse thrust to back the aircraft up on the ground while taxiing. The thrust reversers can also be used in flight at idle-reverse for added drag in maximum-rate descents. In vortex surfing tests performed by C-17s, up to 10% fuel savings were reported. For cargo operations the C-17 requires a crew of three: pilot, copilot, and loadmaster. The cargo compartment is 88 feet long by 18 feet wide by 12 feet 4 inches high. The cargo floor has rollers for palletized cargo but it can be flipped to provide a flat floor suitable for vehicles and other rolling stock. Cargo is loaded through a large aft ramp that accommodates rolling stock, such as a 69-ton M1 Abrams main battle tank, other armored vehicles, trucks, and trailers, along with palletized cargo. Maximum payload of the C-17 is 170,900 lb, and its maximum takeoff weight is 585,000 lb. With a payload of 160,000 lb and an initial cruise altitude of 28,000 ft, the C-17 has an unrefueled range of about 2,400 nautical miles on the first 71 aircraft, and 2,800 nautical miles on all subsequent extended-range models that include a sealed center wing bay as a fuel tank. Boeing informally calls these aircraft the C-17 ER. The C-17's cruise speed is about 450 knots (Mach 0.74). 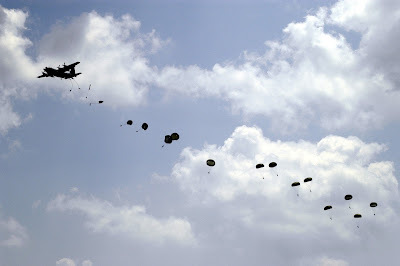 It is designed to airdrop 102 paratroopers and their equipment. The C-17 is designed to operate from runways as short as 3,500 ft and as narrow as 90 ft. In addition, the C-17 can operate from unpaved, unimproved runways (although with greater chance of damage to the aircraft). The thrust reversers can be used to move the aircraft backwards and reverse direction on narrow taxiways using a three- (or more) point turn. The plane is designed for 20 man-hours of maintenance per flight hour, and a 74% mission availability rate. The Boeing F/A-18E Super Hornet and related twin-seat F/A-18F are twin-engine carrier-capable multirole fighter aircraft variants based on the McDonnell Douglas F/A-18 Hornet. The F/A-18E single-seat and F/A-18F tandem-seat variants are larger and more advanced derivatives of the F/A-18C and D Hornet. The Super Hornet has an internal 20 mm M61 rotary cannon and can carry air-to-air missiles and air-to-surface weapons. Additional fuel can be carried in up to five external fuel tanks and the aircraft can be configured as an airborne tanker by adding an external air refueling system. Designed and initially produced by McDonnell Douglas, the Super Hornet first flew in 1995. Full-rate production began in September 1997, after the merger of McDonnell Douglas and Boeing the previous month. The Super Hornet entered service with the United States Navy in 1999, replacing the Grumman F-14 Tomcat, which was retired in 2006; the Super Hornet serves alongside the original Hornet. The Hornet and Super Hornet share many characteristics, including avionics, ejection seats, radar, armament, mission computer software, and maintenance/operating procedures. The Super Hornet is largely a new aircraft at about 20% larger, 7,000 lb heavier empty weight, and 15,000 lb heavier maximum weight than the original Hornet. The Super Hornet carries 33% more internal fuel, increasing mission range by 41% and endurance by 50% over the "Legacy" Hornet. The empty weight of the Super Hornet is about 11,000 lb less than that of the F-14 Tomcat which it replaced, while approaching, but not matching, the F-14's payload and range. 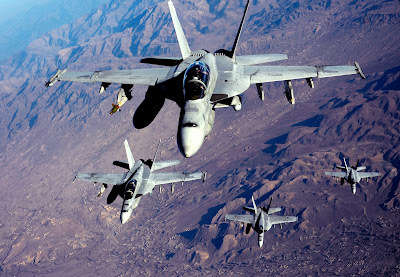 As the Super Hornet is significantly heavier than the "legacy" Hornet, the catapult and arresting systems must be set differently. To aid safe flight operations and prevent confusion in radio calls, the Super Hornet is informally referred to as the "Rhino" to distinguish it from earlier Hornets. The Super Hornet, unlike the previous Hornet, is designed so it can be equipped with an aerial refueling system (ARS) or "buddy store" for the refueling of other aircraft, filling the tactical airborne tanker role the Navy had lost with the retirement of the KA-6D and Lockheed S-3B Viking tankers. The ARS includes an external 330 US gal tank with hose reel on the centerline, along with four external 480 US gal tanks and internal tanks, for a total of 29,000 lb of fuel on the aircraft. On typical missions a fifth of the air wing is dedicated to the tanker role, which consumes aircraft fatigue life expectancy faster than other missions. During the 2006–2007 cruise with Dwight D. Eisenhower, VFA-103 and VFA-143 supported Operations Iraqi Freedom, Enduring Freedom and operations off the Somali coast. Alongside "Legacy Hornet" squadrons, VFA-131 and VFA-83, they dropped 140 precision guided weapons and performed nearly 70 strafing runs. The Lockheed C-130 Hercules is a four-engine turboprop military transport aircraft designed and built originally by Lockheed, now Lockheed Martin. Capable of using unprepared runways for takeoffs and landings, the C-130 was originally designed as a troop, medevac, and cargo transport aircraft. 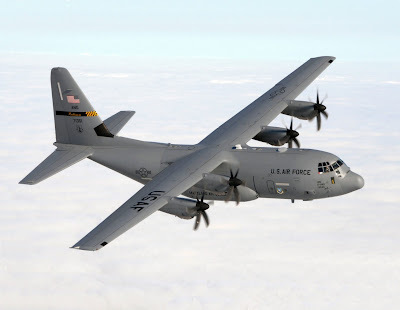 The versatile airframe has found uses in a variety of other roles, including as a gunship (AC-130), for airborne assault, search and rescue, scientific research support, weather reconnaissance, aerial refueling, maritime patrol, and aerial firefighting. It is now the main tactical airlifter for many military forces worldwide. Over forty models and variants of the Hercules, including a civilian one marketed as Lockheed L-100, operate in more than sixty nations. The Lockheed Martin C-130J Super Hercules is a four-engine turboprop military transport aircraft. The C-130J is a comprehensive update of the Lockheed C-130 Hercules, with new engines, flight deck, and other systems. The Hercules family has the longest continuous production run of any military aircraft in history. During more than 60 years of service, the family has participated in military, civilian, and humanitarian aid operations. The Hercules has outlived several planned successor designs, most notably the Advanced Medium STOL Transport contestants. Fifteen nations have placed orders for a total of 300 C-130Js, of which 250 aircraft have been delivered as of February 2012. As a cargo and airlift aircraft, the C-130J's crew includes two pilots and one loadmaster (no navigator or flight engineer), while specialized USAF variants (e.g., AC-130J, EC-130J, MC-130J, HC-130J, WC-130J) may have larger crews, such as navigators/Combat Systems Officers or other specialized officer and enlisted air crew. The U.S. Marine Corps KC-130J uses a crew chief for expeditionary operations. The C-130J's cargo compartment is approximately 41 feet long, 9 feet high, and 10 feet wide, and loading is from the rear of the fuselage. The aircraft can also be configured with the "enhanced cargo handling system". The system consists of a computerized loadmaster's station from which the user can remotely control the under-floor winch and also configure the flip-floor system to palletized roller or flat-floor cargo handling. Initially developed for the USAF, this system enables rapid role changes to be carried out and so extends the C-130J's time available to complete taskings.